"Fans, we have something HUGE to announce! We are getting ready to kick off a busy season of releases and exclusives, and to help celebrate, we are launching our biggest giveaway EVER in the history of our store! -We are giving away 30 Baby TULA carriers, one each day starting today through October 22nd. -We are using one rafflecopter to collect all of the entries, BUT each day will be a specific print and size as the actual prize. By entering the rafflecopter, you are entered for all 30 prizes. 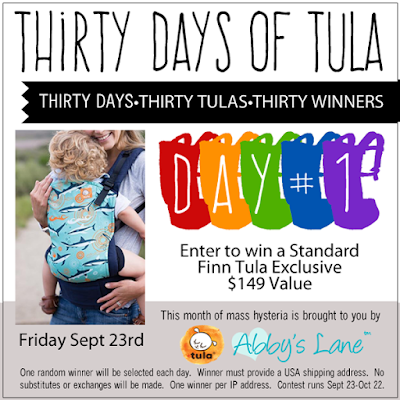 Click below for full details, and watch every day for the newest prize post!